Page revised in November 2016. Links to this page can be found in Book 8, Map C2, Day 4, View C6, Rione Colonna, Rione Sant'Eustachio and Rione Campo Marzio. 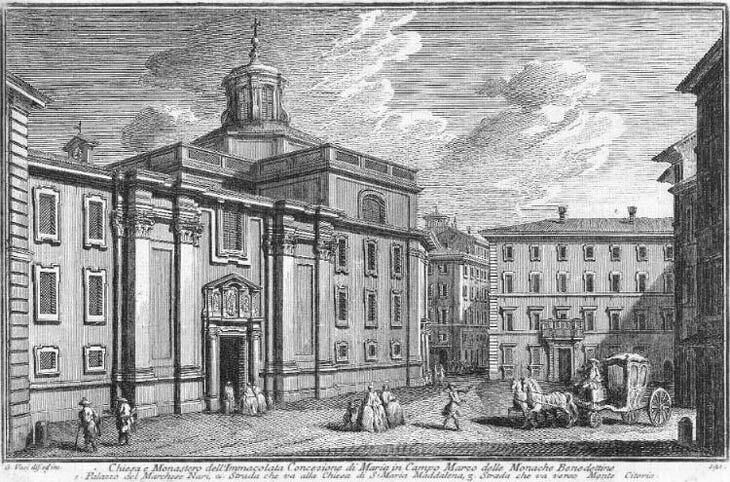 In 1758 Giuseppe Vasi opened his eighth book of etchings showing the monuments of ancient and modern Rome with one of the oldest nunneries, which was founded in the VIIIth century by Greek nuns who fled from Constantinople. At the time there was a controversy in the Byzantine Empire about the veneration of sacred images and the Iconoclasts (Destroyers of images) prevailed; the nuns opposed this course of action and they came to Rome carrying an image of Mary which was regarded as acheiropoieta (not painted by human hand). The view is taken from the green dot in the 1748 map below. 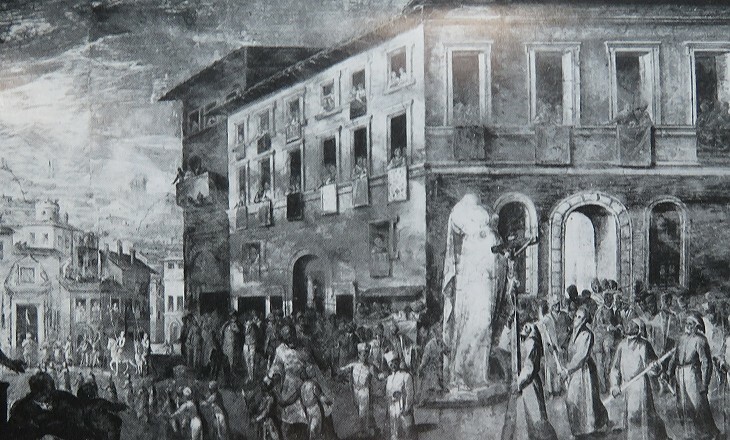 In the description below the plate Vasi made reference to: 1) Palazzo Nari; 2) Street leading to S. Maria Maddalena; 3) Street leading to Piazza di Montecitorio. 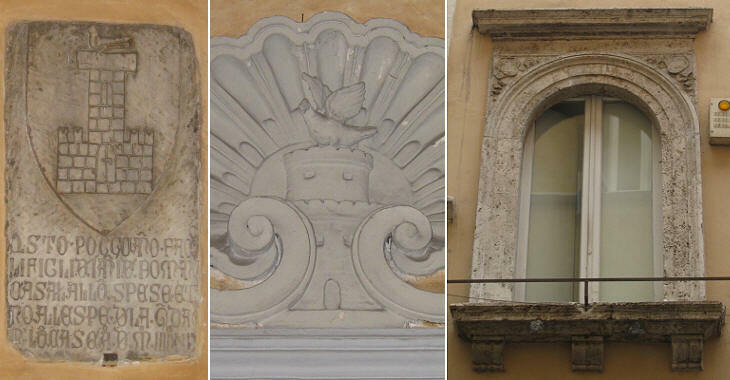 The map shows also 4) Immacolata Concezione in Campo Marzio; 5) S. Gregorio Nazanzieno; 6) Palazzo Casali. The dotted line in the small map delineates the borders among Rione Sant'Eustachio (lower left quarter), Rione Campo Marzio (top left quarter) and Rione Colonna (right half). The only minor change relates to the decorations of the portal and of the window above it which have disappeared. A different kind of change relates to the fact that today the building is near two key institutions: Camera dei Deputati (Low Chamber) in Palazzo di Montecitorio and the residence of the Italian Prime Minister in Palazzo Chigi; the nunnery with the exception of the church was confiscated in 1873 and it now houses offices of Camera dei Deputati. This explains the presence of many policemen in the area. XIXth century excavations made in the garden of the nunnery unearthed a column (which was used in 1854 for Colonna dell'Immacolata Concezione) and a small altar, a copy of which stands to the left of the entrance. Immacolata Concezione is the second church of the nunnery: it is located inside a small and elegant courtyard which can be accessed from the entrance on the street and from the main courtyard of the nunnery; this arrangement allowed the public to pray to the sacred image without causing distress to the secluded nuns (in the image used as background for this page you can see another view of the portico). The church was built in 1563 at the initiative of Abbess Chiarina Colonna. Giovanni Antonio de' Rossi redesigned it in 1682 and, in the lack of a proper street façade, paid a lot of attention to the view of the apse from Via della Maddalena. Its interior, which is spacious and lofty, is in form of a Greek cross, but had been spoiled of its decorations by the French who converted it into a lottery office. 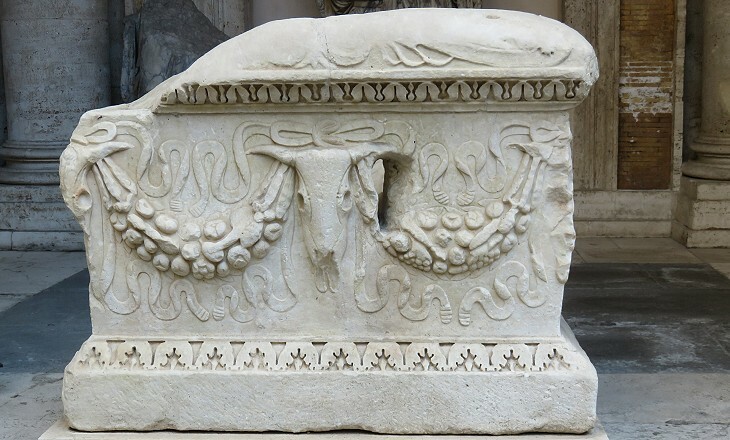 According to tradition the Greek nuns carried with them also the body of St. Gregory of Nazanzius, a IVth century Patriarch of Constantinople and a strong supporter of the Nicene Creed (Nazanzius was a small town near Iconium, today's Konya). The first church of the nunnery was dedicated to the Virgin Mary and to this saint. Today it is not accessible by the public because it is inside the premises belonging to Camera dei Deputati; it can only be seen from the entrance to the main courtyard of the nunnery. 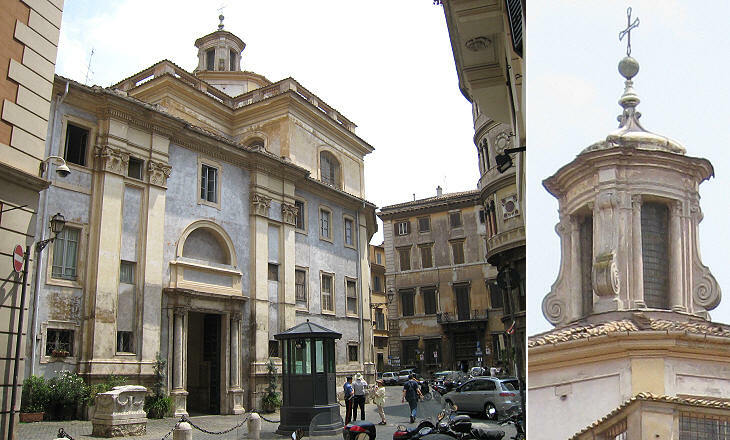 In 1505 during restorations of the church floor the body of the saint was found and in 1580 it was moved to S. Pietro. 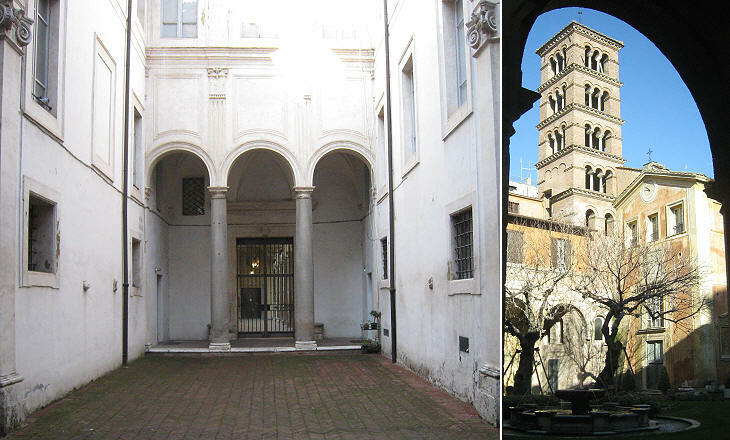 (left) Main courtyard; (centre) Romanesque bell tower; (right) a clock indicating the "Italian Hour"
Cardinal Gregorio Naro (1581-1634) is the most famous member of this family; his aunt was sister-in-law of Pope Paul V; most likely he commissioned the renovation of houses belonging to the family between Piazza delle Coppelle and Piazza di Campo Marzio. The elaborate decoration of the portal and the balcony are a later addition. On June 11, 1580 a solemn procession accompanied the body of St. Gregory of Nazanzius from Immacolata Concezione to S. Pietro; the event was depicted in a fresco by Matteo Bril and Antonio Tempesta (an illustration from Guida di Campo Marzio - Palombi Editori opens in another window) in Palazzo Apostolico. 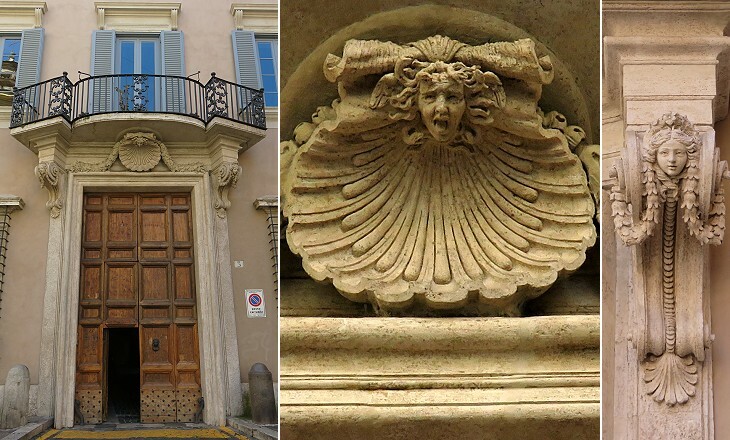 It is the only evidence of the Renaissance appearance of Palazzo Casali which in the XIXth century was redesigned in a very ordinary way. However the main entrance is still decorated with medieval and baroque reliefs showing the heraldic symbols of the Casali. Next plate in Book 8: Monastero dello Spirito Santo. 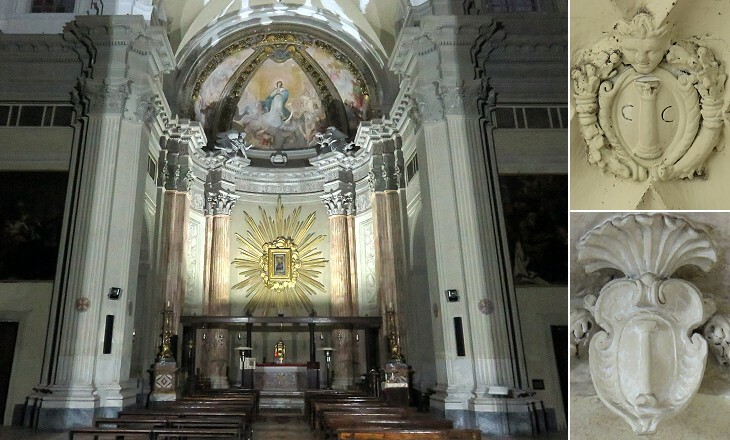 Next step in Day 4 itinerary: S. Maria Maddalena. You have completed your tour of Rione Sant'Eustachio! 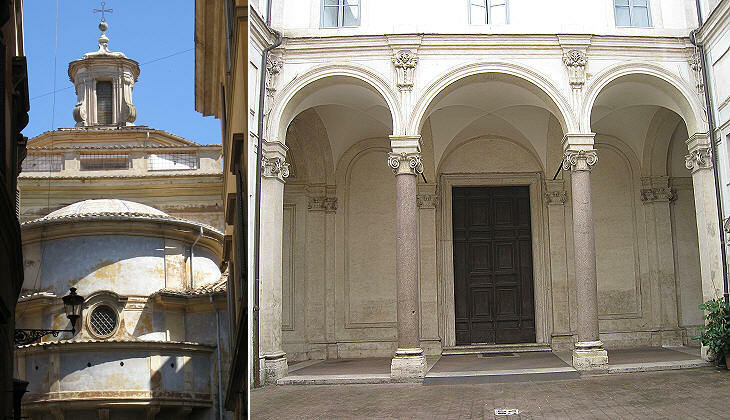 Start your tour of Rione Colonna: next step: S. Lorenzo in Lucina. 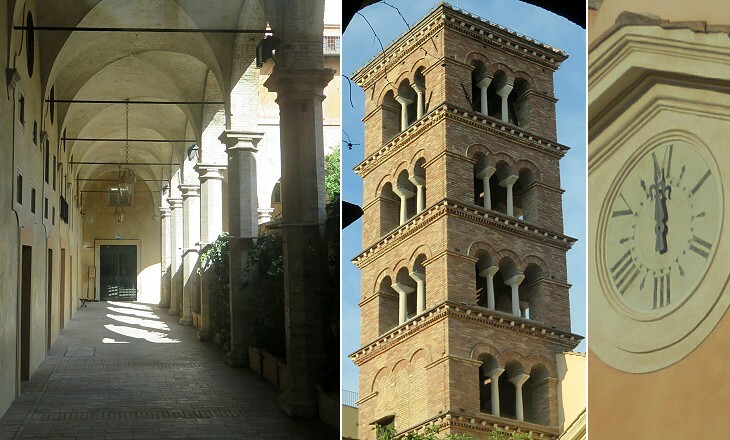 Start your tour of Rione Campo Marzio: next step: S. Nicola de' Perfetti. Molto celebre, ed antico è questo monastero, poichè eretto per le monache Basiliane, come dicemmo fuggire dalla Grecia per la persecuzione di Costant. Copronimo, portando seco il corpo di s. Greg. Nazianzeno, la testa di s. Quirino vesc. e mart., una immagine della ss. Vergine, ed altre reliquie, e le collocarono nella loro chiesa; e fu di tanto credito l'osservanza, e la vita religiosa di quelle monache appresso i Sommi Pontefici, Re, e Principi, che fecero ad esse molti donativi di cartelli, villaggi, e possessioni; onde vi concorsero molte dame, e fanciulle Romane, ma poi nata la difficoltà dell'uffiziatura Greca, vi si pose la regola di S. Benedetto. Greg. XIII. trasportò il corpo di s Gregorio al Vaticano l'anno 1580. vi lasciò però un braccio con altre reliquie. In oggi è stato rimodernato il monastero, e ornata la chiesa di marmi, e pitture. Il s. Gregorio, e il s. Benedetto, che si vedono dipinti sulla porta del monastero, sono di Gio: Batista Speranza, e la Madonna è del Sermoneta. Il quadro di s. Benedetto, che sta in chiesa, è di Lazzaro Baldi, e quello della Madonna viene dalla scuola di Giulio Romano.